January 7, 1996. 13-3 regular season record. #1 seed in the AFC and Divisional home game against the Indianapolis Colts. Chiefs lose 10-7 due to Lin Elliott, who had hit 80% of his FG's, missing from 35, 39, and 42 yards. January 11, 2004. 13-3 regular season. #2 seed in the AFC and Divisional home game against the...you guessed it. Indianapolis Colts. Also known in Kansas City as the "No Punt" game. Chiefs lose 38-31 in a game that saw neither team punt but was decided on one Chiefs turnover. January 4, 2014. No home game here, but by far the hardest one to stomach. Kansas City would lose 45-44 in.... Well, Indy after leading 38-10. On one play Andrew Luck fumbled the snap only for the ball to bounce perfectly back to him for a running touchdown. Biggest collapse in Chiefs postseason history. KC would win a playoff game in Houston in 2016. Losing to Brian Hoyer would've been too cruel. The football gods finally gave us one. But it would be short lived losing in New England the following week. The next year, the heartache would continue. January 15, 2017. #2 seed in the AFC and yet another Divisional home game. This time against the Pittsburgh Steelers. Has your team ever lost a playoff game after scoring 2 TDs and not giving up a single TD? No, because it only happened once in NFL Postseason history. This game. Chiefs lose 18-16 after Boswell goes a perfect 6/6 on FGs. To make matters worse, the Chiefs would tie the game at 18 late in the 4th on a successful 2-pt conversion attempt only for it to get taken away on a holding call. January 6, 2018. Divisional home game against the Tennessee Titans. Chiefs go into the half up 21-3 only to fail to score a single second half point in a 22-21 loss. The start of the Titans rally you ask? Oh just your everyday throw from Marcus Mariota that gets batted back to him for a receiving TD. The Chiefs have found insane ways to crush the hopes of Chiefs Kingdom time and time again. From death by what seems like a thousand field goal paper cuts to QBs getting lucky bounces to score themselves, nothing would surprise this fan base because we've seen it all. But then this day came. A chance to abolish an 0-6 home playoff stretch. A chance to beat an Indianapolis team that we'd seen four times during a grueling 21 year stretch and failed to beat once. But on top of it all, a chance to host the city's first ever AFC Championship game. Walking into the stadium, the atmosphere was electric as usual. But there was something different to it on this day. That tense feeling you got from their previous playoff games was gone. The fans and players were loose. No thoughts about the past just what was ahead. The Chiefs found themselves up 17-0 thanks to a beautiful start on both sides of the ball. Even the defense showed up. Nothing was stopping us today. Then, the Colts blocked a Colquitt punt that was recovered for a TD. Silence. Around Arrowhead, that energy, that confidence, gone in a flash. Replaced by flashbacks of the past. Surely not. This wouldn’t be known as the "Blocked Punt" game would it? Another choke to the Colts on a big stage? I can tell you it was in every Kansas City fans' mind. That is until Patrick Mahomes stepped back on that field, took control and did something that this city hadn't been used to after years of misfortune. He answered. 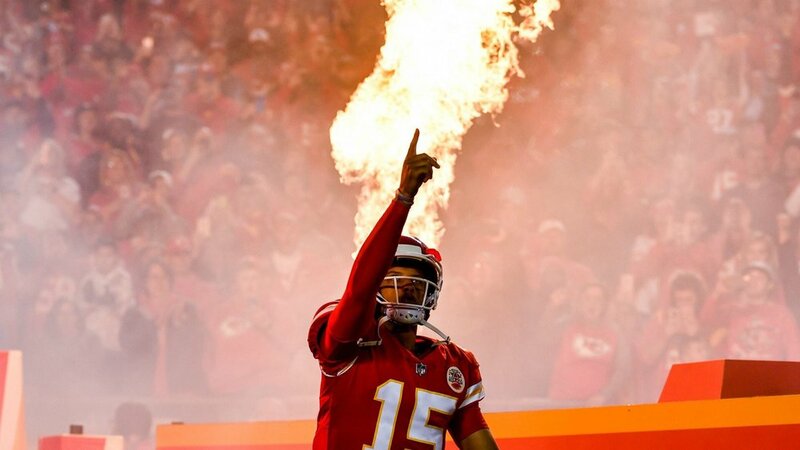 At that moment every Chiefs fan could feel it. This team; this leader, he was special; and for once he wasn't Indy's, he wasn't New England's, he wasn't Denver’s, he was ours. That once hopeless feeling that covered Arrowhead and the city was gone and replaced by a future that was bright.